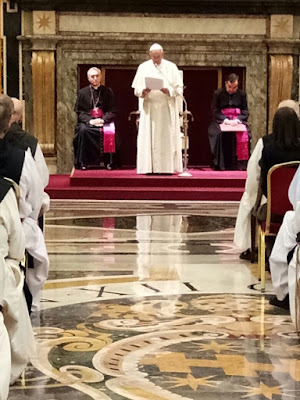 Trappist communities provide a valuable counter-cultural witness in today’s consumerist society, the Pope told members of the general chapter of the Order of Cistercians, Strict Observance (OCSO), which is currently meeting in Assisi. The order is separated into two chapters, one male and one female, but they hold a joint general chapter meeting once every three years ‘to foster peace and charity among themselves, and to make appropriate decisions for maintaining the patrimony and unity of the Order’. The order’s separate existence from the rest of the Cistercian family is rooted in an internal reform movement which began in the 1660s at the La Trappe Abbey in Normandy, France — hence the name ‘Trappist’ for the order’s members. The reformers felt that the Cistercian order had started to become relaxed in its observance of the Rule of St Benedict and in 1692, Papal recognition was given to the new group known as the Order of Cistercian Strict Observance (OCSO). In common with the Cistercian Order of Common Observance (OCist), which was founded in 1098, Trappist monks and nuns wear white robes over their habits. In Ireland, there are six OCSO foundations: Our Lady of Bethlehem Abbey in Portglenone, Co Antrim; Bolton Abbey in Moone, Co Kildare; Mellifont Abbey in Co Louth; Mount Melleray Abbey in Co Waterford; Mount St Jerome Abbey, near Roscrea, in Co Offaly, and Ireland’s only Cistercian monastery for women, St Mary’s Abbey in Glencairn, Co Waterford.